This recipe for Lime Soup, one of my favorites and something that appears on my kitchen table every few months, is from my second cookbook: Broth and Stock. I developed it after tasting bowl after bowl of the Lime Soup on a visit to Mexico’s Yucatàn Peninsula, a place that offers a unique, lively cuisine steeped in both Mayan and Spanish culinary influence. My family climbed the vine-draped limestone ruins at Cobá, before our guide drove us along the winding orange-red roads through the jungle. We reached a cenote, a deep, naturally occurring limestone well filled with clean fresh water, where we swam until tired and worn. Now hungry from climbing and swimming, we headed to a small restaurant along the lake at Cobá, where they served traditional Yucatecan cooking, among the dishes they offered was a classic lime soup. Nearly every restaurant along the Yucatán Peninsula offers its own perfect version of lime soup, some with bell peppers and others touched with cinnamon and oregano. I favor the simplest approach with chicken, onion, rice, and limes. Simple foods often make the best foods, as their humble ingredients shine through without pomp or pretense. There’s a lot to be said about the goodness of chicken soups and bone broths, those well-loved soups found all across the globe in pots tended by loving cooks. It’s this pots of simmering chicken that helped to nurse children and grownups through colds, to bring comfort and warmth to the table in winter and to simply provide wholesome, satisfying meals that were, optimally, easy to prepare. And that’s what Lime Soup is: comforting, bright, and impossibly simple to make. You don’t need a separate bone broth or stock to make this; rather, like classic soups and stews from all over the world, Lime Soup is a dish that makes its own broth. First, the chicken is simmered until the meat is tender, and as it simmers in a large and heavy stock pot, it develops a lovely, delicately flavored broth. From there you remove the chicken, shredding its meat and adding it back to the pot where it stews with onions and rice before you ladle the soup into bowls and top it with cilantro, avocado, jalapeno, homemade tortilla strips fried in pastured lard, and cotija cheese as it suits you. A delicate, light chicken broth serves as a base for this traditional Yucatan-style lime soup that's graced by limes, jalapenos, cilantro and crumbled cotija cheese. This recipe is reprinted with permission from Broth & Stock from the Nourished Kitchen, written and photographed by Jennifer McGruther, 2016. Published by Ten Speed Press, an imprint of Penguin Random House LLC. Carefully remove the chicken from the pot, setting it on a platter to allow it to cool until it’s comfortable enough to handle. Remove and discard the skin, pull the meat from the bone, and shred it with a fork. 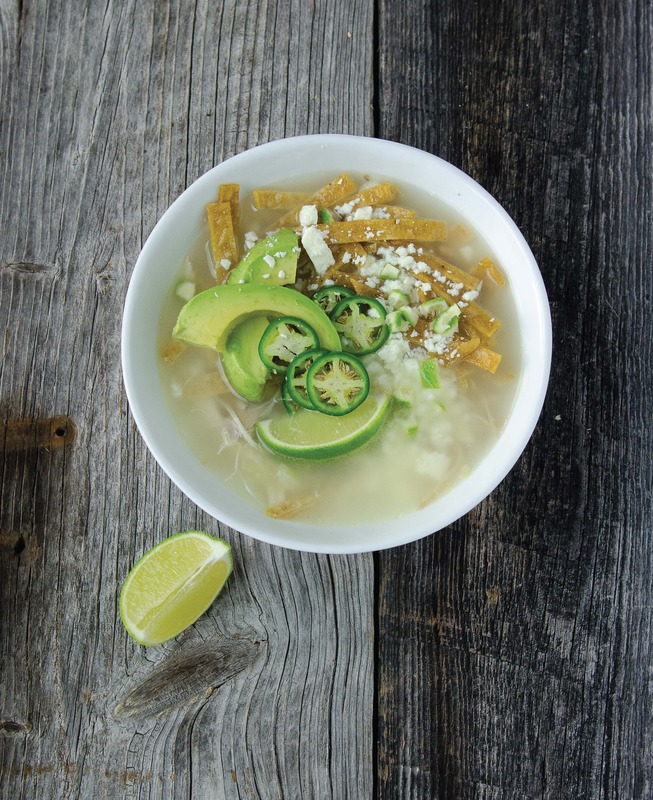 Ladle into soup bowls and serve with the chopped lime, sliced jalapeño, crumbled Cotija cheese, sliced avocado, and tortilla strips. Well-liked, chicken makes an easy meal. For both flavor and nutrition, we recommend pasture-raised or organic, free-range birds and you can read more about why pasture-raised makes such a big difference in The Nourished Kitchen and Broth and Stock. Farmers markets are a great place to find pasture-raised chickens and eggs, but you can also find free-range and humanely raised chicken online if none is available in your area. This Cream of Chicken Soup is the real deal: a luscious, velvety mix of chicken and vegetables, broth, cream and herbs. It’s prepared traditionally, using egg yolks as a thickener instead of a sticky roux. Green Chile Chicken Chili is a great mix of chicken and tender white beans with a bright punch of a traditionally fermented green chile salsa which gives it a bright, sour and spicy edge. Pan-Roasted Chicken with Tarragon and Mustard Cream Sauce beautifully blends bright, sweetly fragrant tarragon with sharp mustard and mellow cream for an utterly delicious sauce that coats pan-roasted chicken. Savory-Roasted Chicken with Preserved Lemons is easy to adapt to just about any herb or hearty root vegetable, and is great served with a salad. Is the fermented foods course still available. I can’t seem to find a link to it. No, it’s not currently available, but we hope to offer a new course soon.